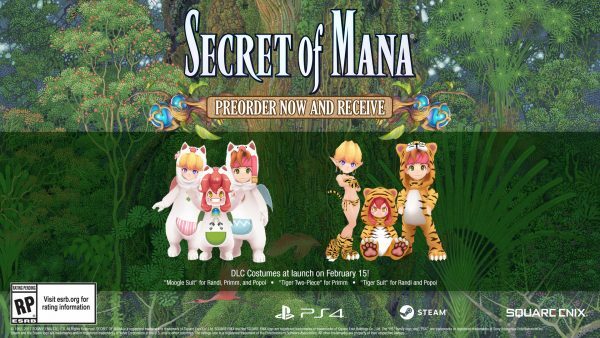 Square Enix announced on Friday that they have completely revamped the classic SNES title Secret of Mana title with high-definition 3D graphics and voice-over. The game will be released for the PlayStation 4, PS Vita, and STEAM. The game is scheduled for global digital release on February 15th, 2018. Those who preorder from the PlayStation Store will receive special character costumes: “Moogle Suit” for Randi, Primm and Popoi, “Tiger Two-Piece” for Primm and “Tiger Suit” for Randi and Popoi, as well as three PlayStation Network avatars. Those who pre-purchase the game, or purchase the Day 1 Edition within one week of the launch on STEAM, will receive the three costumes as well as a downloadable wallpaper.